Looks like TI introduced an improved TL431"I" as recently as November 2018. The "I" version tightened up some of the reference specifications. After 40 years of baking the same cake they found a way to make it better. 7200 seconds to submit a form. So if you're editing a post and it takes longer than 2 hours to submit it will log you out. I have to log back on multiple times a day...(I guess I don't have too). Sadly I've had more than one longer post get scrubbed when I log back on... I do not always rewrite the effort. Like I said It may be a browser thing. I remember being able to back up and find unfinished posts before in the browser cache. I understand backing us out to save server capacity, but wish it didn't eat my homework. I can get distracted, apparently. Just wondering why I've never used (or seen) a TL431. If the adjustable voltage went lower than 2.5V it would rock as a bias string for power amp output stages, but 2.5V is a bit too much voltage. I vaguely recall an article from decades ago about how the 2.5V nominal reference level was necessary to deliver good temperature stability. I've even used LEDs as low voltage references where I could have used a TL431... go figure. 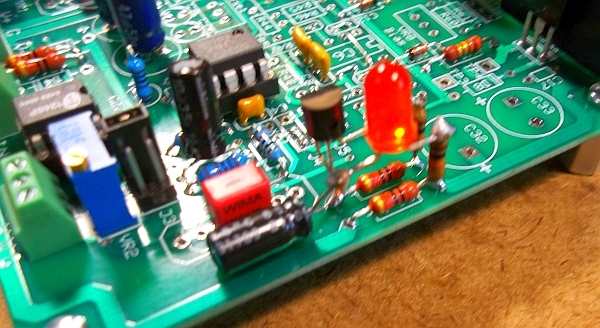 The TLV431 has a 1.25V reference and I think they are used as bias spreaders. The data sheet I looked at this morning said 2.5V (unless I was dreaming), I'll check again (later). 1.25V or higher adjustable would certainly work for biasing up output stages that are often 4xVbe while those popular Vbe multipliers used there are generally thermally coupled to the heat sink to track with output device temperature. A bias device that doesn't change with temperature might defeat that design concept. I see what they did there.... TLV is a different part... Perhaps I wasn't the first one looking for lower voltage operation. So I am not (completely) crazy. And then there's also HV versions and increased-current versions. To be honest I had been aware of the TL431 since it came out in the 1980s(?) but had never used it. Like yourself a big ho-hum. Yawn. "Poo-pooed." When I needed a shunt regulator for the ZTX851 low noise moving coil front-end I sort of discovered it. Though it could be quieter in that application it is a common mode noise source so it doesn't really matter. Going through the datasheet and seeing its' "legitimate" use as a comparator made me think "I may have a home for this circuit some day." The one thing about using the TL431 is its "Vcesat." The "LV" version should reduce it's Vcesat. Re: A peak responding current shunt monitor using a TL431 as a comparator to indicate driver overload. An update on the circuit JR has previously poo-pooed. My reverb experiments have shown me that a zero ohm output with equalized drive to simulate constant current is the way to go. Constant current drive, or an approximation of it, is necessary with highly inductive drive transducers. Current, not voltage, does the work. The reverb is using two Type 9 drivers in parallel to maximize electrical damping. The transducers represent a 5Ω load at 1 kHz. At high frequencies, where the impedance of the driver transducer is much higher, a correspondingly larger peak voltage is required to maintain the same level of current. At the recommended nominal drive of 56 mA RMS (two transducers) only 280 mV drive is required at 1 kHz. With 30V supplies the amount of voltage available, versus the amount of voltage needed, is quite large. While there is plenty of voltage and current headroom in the driver, current headroom in the transducer is limited by distortion and burn-out. If we assume that 10 dB overdrive is a satisfactory headroom margin for a reverb, then the peak current works out to be just under 250 mA. Voltage across the transducer is obviously not a good way to measure transducer current or overload. At DC the transducer resistance is below an Ohm - wiring resistance and the output impedance of the driver have an effect on LF response. A simple form of current limiting is needed without introducing any DC resistance in the output. Taking feedback from the load side of a output build-out resistor could keep the output impedance low but, with an inductive transducer, stability would be a problem. Some other form of simple passive current limiting would be better. At what current do the Type 9 transducers burn out? At some point however a dash-board light needs to light up and signal "Stop this." Enter the TL431 peak flasher ":winky:" that JR hates about as much as squirrels in his yard. A peak responding current shunt monitor using a TL431 as a comparator to indicate driver overload. Circuit fragment with driver op amp not shown. To limit available current to values that are hopefully "safe" under extreme overload conditions, the old trick often used in headphone amplifiers of adding collector resistance is used here. Resistors at the collectors of the output transistors collapse the supplies under extreme current overload. Because the collector resistors are inside the feedback loop they don't raise output impedance until they begin to collapse. For this application a value of 10-20Ω seems about right. Having a resistor in the collector provides the opportunity for output current to be measured indirectly. Reading the peak voltage across R1 provides a measure of load current. 250 mA conveniently develops 2.5V peak across R1. The TL431, operating as a comparator, begins to draw current through its cathode connection when the voltage between the reference pin and anode exceeds 2.5V. At 250 mA peak the dash board warning light (the LED winky) lights up. The 10µF/50V cap stretches the peak providing a bright, crisp LED turn-on with a clearly-defined threshold voltage and peak hold capability. Unlike the original post, the LED current, just under 3 mA, flows from the positive to negative supply. R1 develops a current sample voltage as well as limits negative drive current. R2 is a necessary series resistor to limit input current to the TL431. R2 is required even if R3 is not used. R3 provides voltage division to provide trip voltages greater than 2.5V if needed. The 1.25V version of the TL431 can also be used. The TL431 peak-responding current shunt monitor, costs only pennies and works much better than a transistor in this application. The long wind-up leads to this art shot showing how damn simple it is to use the TL431 as a fast peak-responding threshold detector. 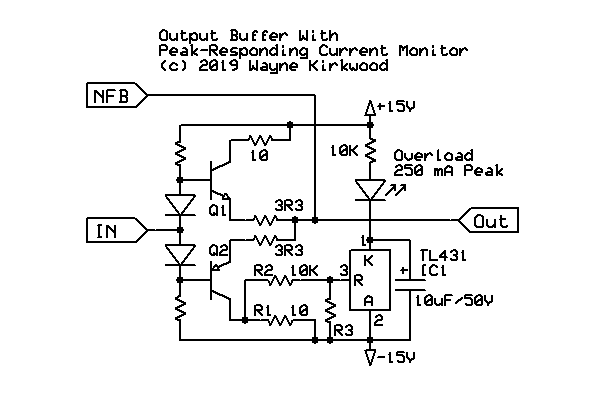 TL431 Current Shunt Monitor used to indicate overload in a spring reverb transducer driver.